It's only been three games, but at the moment Philadelphia is the capital of the baseball world. The Phillies finished a sweep of the reigning NL East champion Braves on Sunday in front of a national television audience, and more than 130,000 fans came to Citizens Bank Park during the opening series. The Phillies haven't opened a season with four straight wins since 1915. “The fans showed up for us each night, especially when it’s cold out tonight, they still showed up," said Bryce Harper after Sunday's 5-1 win. "That what it’s all about. They grind with you all year long. They expect us to play good baseball, and we expect ourselves to play good baseball." Even at 1-1 in the fifth, Rhys Hoskins worked a bases loaded walk to force in a run to give the Phillies a one run advantage. J.T. Realmuto followed with a sacrifice-fly to right to score Jean Segura to give the Phillies a 3-1 lead. Harper then homered in the seventh and Maikel Franco delivered an RBI-single to push the Phils advantage to 5-1 and that's where it would stay. Adam Morgan, Hector Neris, and Pat Neshek combined to toss three innings in relief, surrendering just one hit. Manage Gabe Kapler used the same batting order in all three contests against the Braves. He did that just once all of last season. He also allowed starters, Aaron Nola and Jake Arrieta, to pitch out of trouble and didn't go with a quick hook to the bullpen - something he often would do last season. Think back to games last year where the Phillies fell behind early. Often, a three-run deficit felt insurmountable. That's not going to be the case this year with this potent offense. Sure, there will be the inevitable bumps in the road, but now a pitcher can have some faith that surrendering a run here or there won't necessarily cost the Phillies a ballgame. "I’m going to run into those kinds of outings, but our hitters were off the charts today," said Aaron Nola following Thursday's season opener where he surrendered a career-high five walks and struggled at times with location. "I mean 10 runs, what else can I say about that? Pretty awesome." Neshek is sometimes overlooked when it comes to name-dropping some of baseball's best relievers, but his stuff is nasty and he's a solid veteran presence in the clubhouse. He appeared in all three games against the Braves, picking up three strikeouts over 2 2/3 innings. 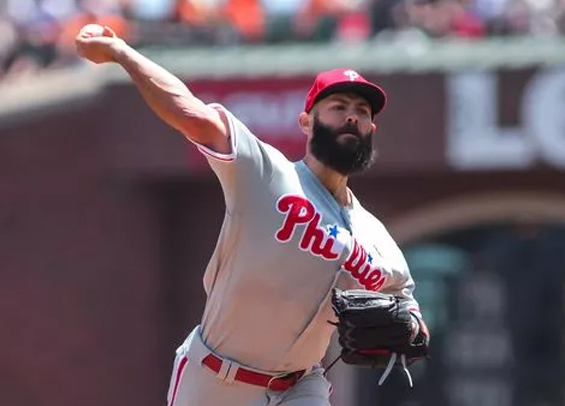 Though Kapler hasn't formally announced anything about his bullpen regarding specific roles, it's clear Neshek will act as a bridge to get to either Seranthony Dominguez or David Robertson.